Peter Hinssen: Peter Drucker once said “Because the purpose of business is to create a customer, the business enterprise has two–and only two–basic functions: marketing and innovation. Marketing and innovation produce results; all the rest are costs.” Especially today – now that customers are so empowered, so vocal – marketing is even more crucial than ever. Simon Mainwaring: The dynamics that used to drive marketing have completely changed. It used to have a broadcast approach: large organizations were the only ones to have access to the media. Brands used to be in control. Now consumers have grabbed the power. The monologue that marketing once was has become a dialogue. The result is a real shift in terms of social marketing. Brands need to share how their efforts impact the real world, by showing the results of their endeavours. First of all, brands used to be the ‘celebrities’. Today they are no longer the focus of attention. Focussing on product and price has become irrelevant. The answer lies in a different kind of storytelling. Brands need to tell stories about the good they are doing. Not in a self-oriented way, like a lot of them are still doing. Not by patting themselves on the shoulder, telling how much money and energy they have saved by insulating the walls of their offices, … which are by the way structured in an open manner to foster collaboration. They need to shift their approach. They have to share how their efforts impact the real world, by showing the results of their endeavours. Like Starbucks did, with its “Shared Planet” campaign. Or Unilever with “Sustainable Living” or Patagonia with “Don’t buy this jacket” and IBM with “Smarter Planet”. All of them are talking about how to make the world a better place. These are the stories that work. Hinssen: I’m playing the devil’s advocate here, but do you fear that this view might be perceived as somewhat utopian? Is the gap between what companies are really focused on – selling more and getting better margins – and “doing good and talking about results” not an enormous one? Mainwaring: Leaping from one model to the next is challenging, of course. But there are always gaps between a tradition and an innovation. Adapting, and closing these gaps, is always difficult, but that does not mean that there is an actual choice involved. If your environment evolves, so do you. If your customer changes, so do you or you will never sell anything anymore. As to being “utopian”. No it is not. Truly not. It is about reputation. About keeping your customers when they have changed. About selling. The gap between “making money” and “doing good” is closing, and fast. The model of “profit for profit” is no longer tenable. Because consumers are very aware of the multiple global crises: of climate change, access to clean water, weather disasters, poverty, infectious diseases, religious wars… And it is not that we are so much worse off than our ancestors. It is that we are much more informed about what is wrong. Customers favour the companies who are doing actual good, and not just because it is in their best interest to do so. …customers will not support a company that tells stories about health but sells tobacco. 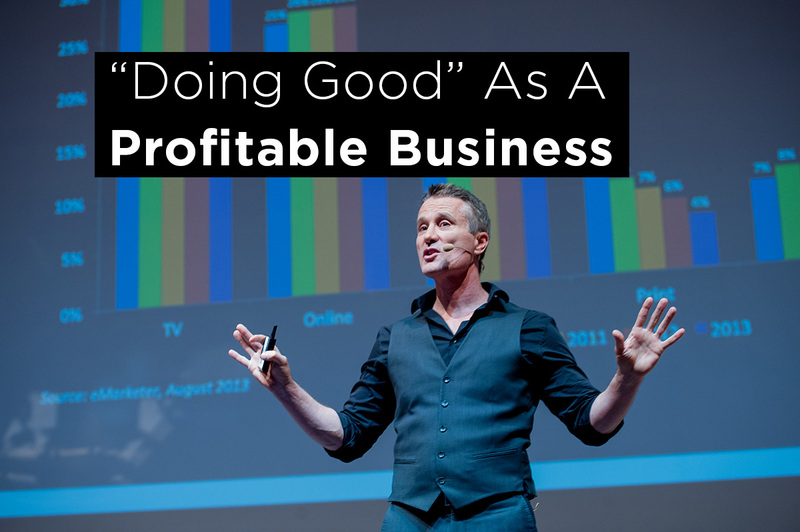 I firmly believe that today “doing good” is a very real business driver. Ignoring this new dynamic is dangerous. Just think of how the CEOs of both Abercrombie & Fitch and American Apparel were forced to resign under pressure of disgruntled customers. Or how the American retailer and health care company CVS Health invested hundreds of millions to repositioning themselves as healthcare and concurrently decided to stop selling selling cigarettes in its 7,600 stores nationwide. Because obviously customers will not support a company that tells stories about health but sells tobacco. In the end, it is all about defining, framing and leading a cultural conversation that is purposeful. Advertising any other way –with ‘just’ pretty pictures and fun slogans – will no longer work. Hinssen: Do agree that the dynamics behind this change in marketing, are similar as those driving the sharing economy? And that although the ethics and sharing part of both are important, they are very dangerous to ignore, from a business model point of view. Mainwaring: Oh, yes, absolutely. The collaborative economy, the sharing economy, peer to peer efforts and crowdsourcing: these all are “symptoms” of the same issue. People are fed with up with consuming more and more. When you think of it, the absurdity of this system is baffling. In more than one way, it is a Ponzi scheme, just waiting to collapse. Today, people want to build their own futures. All these collaborative and sharing initiatives have new business models that are looking at how we can leverage existing resources in the smartest way. And how to use them more and better with the least impact possible. People are fed with up with consuming more and more. So yes, ignoring this paradigm shift is a huge risk. I do realize that we are still very early days. That a lot of decision makers are still very much caught in their ‘profit for profit’ mindset. And that has a lot to do with how companies are organized. Even our incentive systems are focused on short term goals. But what if we would change them to encourage long term thinking? Like by giving bonuses which are tied to the reduction in an organization’s carbon footprint? Hinssen: What about storytelling inside the walls of our companies? Because if our customers expect us to have a positive impact on our environment, so will our employees. Hinssen: How would you convince the non-believers about this new way of marketing which is all about purpose and results? Mainwaring: Well, businesses used to think that we would never run out of resources, that stocks would keep going up, that real estate prices would keep climbing… In short: that ours is an exponential world. But more and more of us are realizing that we are living on a finite planet and we need to shift to a new way of thinking where businesses do have a social role, and not just a commercial one. For me, it is not a question of choice. It is what consumers demand. It is what employees expect. And it is what the competition is already doing. It is not an “if” question, it should be: “WHEN should I change my way of marketing?” Today, I would say, because there is no advantage like that of being a first mover. Peter Hinssen is one of Europe’s thought leaders on the impact of technology on our society. To learn more about Peter please visit this link. Deficit hawks say “STOP SPENDING” but maybe it’s time to take a closer look at the ethics on the revenue side.